This project still amazes me, for both its goofy element and for its cross-time collaborative element. 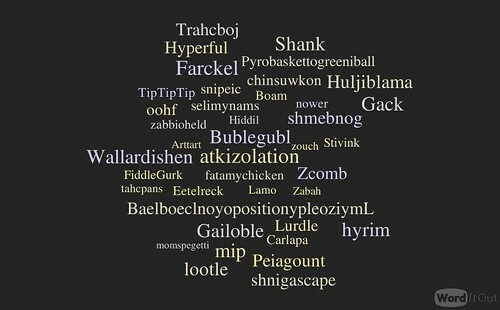 It’s known as the Crazy Collaborative Dictionary, a project connected to my sixth graders learning about the origins of words into the English Language. Way back in 2005, I had this idea of students inventing their own words and definitions, and creating a small class dictionary. It was a huge hit with the kids, and allowed us to consider the evolving nature of our language — of how new words arrive all the time. What began on paper developed into a Wiki site, where students learned about wikis and collaborative writing. 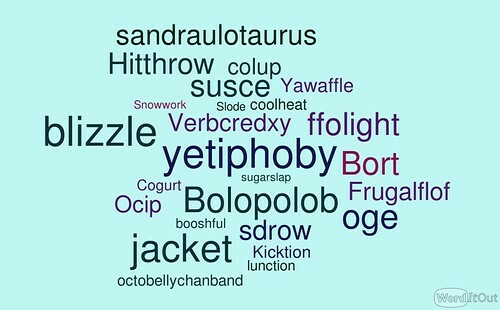 I’ve used different platforms over the years, and this year, I tried out a Submission Form to create a database of words. A few years ago, I added podcasting to the mix, too, so that all students get to have a recorded version of their sixth grade voice attached to their word in the dictionary project. We’re close, if not beyond, 1,000 invented words in the dictionary, and it occurred to me that the first set of words were created before my current students were even born. The original word-makers are now in their mid-20s. Some of the older siblings of my current students have their words in the same digital document as their younger brothers and sisters. I often refer to the dictionary as a “collaboration across time.” There’s something about that idea — of a collaboration that unfolds slowly, over many years — that I find intriguing, sort of a nice counter-balance to the need for immediacy in our lives. This entry was posted in my classroom, Technology Resources. Bookmark the permalink. This is so great. Please thank your class for making me smile.